Silver Steel is a versatile high carbon tool steel [With and without Chrome content], ground to very close tolerances. It has highly polished appearance and extremely fine surface finish. The high carbon content of Silver Steel gives considerable wear resistance when hardened. It is in annealed condition and readily machinable if required. It is mainly used in manufacturing small tools and constructional elements where size accuracy is of prime consideration such as punches, tools, drills, taps etc. 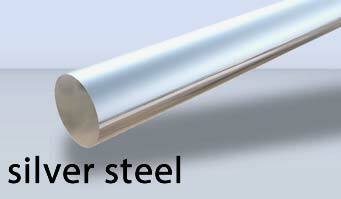 We are a distinguished Manufacturer and Supplier of Silver Steel Rods in India. Our Specialty : Latest Technology, High Grade Steel, Size Customization and On Time Delivery.